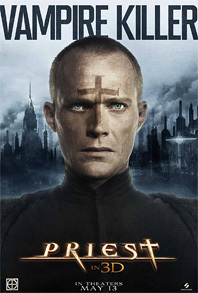 A week ago we featured the official trailer for Scott Stewart's upcoming adaptation of the Tokyopop manga Priest starring Paul Bettany as a warrior priest who hunts vampire creatures in a post-apocalyptic future. IMPAwards got their hands on a series of six character posters and considering I'm a fan of a good series of posters, I thought I'd toss these up today. 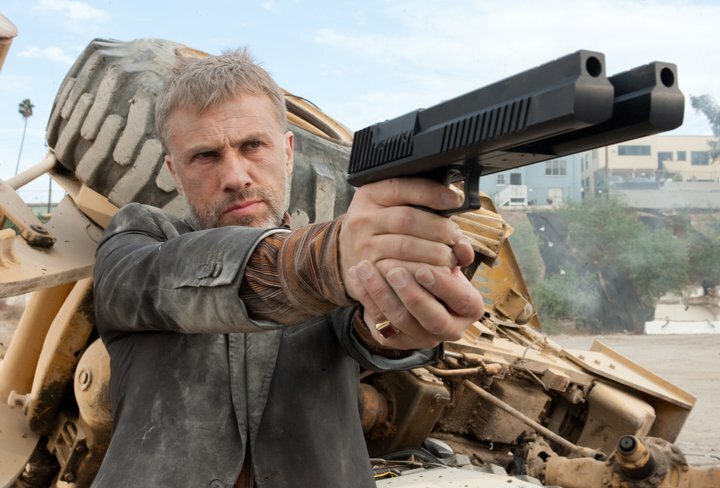 First, that shot of Cam Gigandet above reminds me of Christoph Waltz from Green Hornet, with a gnarly double-barreled gun and all. 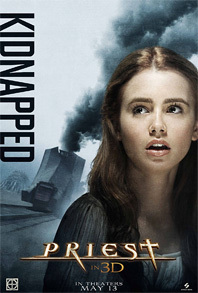 Second, damn Lily Collins looks cute (lower middle). Third, can you tell that's Karl Urban as Black Hat? Because I can't! Check them out below. Priest is an adaptation of the TokyoPop manga created by Hyung Min-woo. It fuses western genre with supernatural horror, gun fu, and dark fantasy themes and is notable for its unusual, angular art style. Here's the short logline: "In a world wrecked by centuries of violent warfare between man and vampire, a warrior priest turns against the church in order to save his kidnapped niece from a homicidal gang of vampires." So something about vampires and… you lost me. 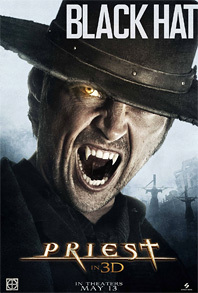 Although, it may be good because this Priest guy actually kills vampires. 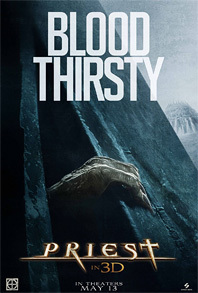 ScreenGems is making a big bet and has scheduled Priest for release on May 13th, 2011 (in 3D). Badass. This is actually starting to shape up a little. I was quite impressed by the trailer. These lil posters, while all intense and polished and actiony...are not good posters. They're pretty typical tight crop sell the talent crap. I do like the coloring, but other than that, i don't know...i just want to see something that feels fresh. The trailer actually makes the movie feel fresher than these posters. 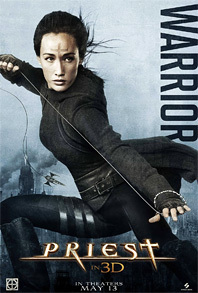 "a warrior priest turns against the church in order to save his kidnapped niece from a homicidal gang of vampires." Does anybody else think this sounds just like John Ford's "The Searchers" only with vampires? I mean, that one was about an old civil war veteran searching for his niece who was kidnapped by indians. Exchange civil war with church, indians with vampires, set it in the future but keep the western element, and you have "Priest!" Never read the manga, so I might be mistaken. #5 ... Good eye skag. I'd definitely go to war with the Warrior. #5 is on the money. To answer #5: The manwha "Priest" is one of the most addictive ones I read and always looked forward to when the next part was being released. Part of which was the drawingstyle of Min-woo that is very unique and the story spans over three time-pieces intertwined. (Wild West, Medieval crusades and Present Day) In the comic it is set in the Wild West where a naive young Priest, conflicted by a forbidden love, is asked by a group of scholars to translate an ancient language, thus setting in motion a series of events orchestrated by a pact of Fallen Angels that starts with the death of his loved one and himself. Instead of death he accepts another soul to enter his body,beside his own, and keep him alive to start the search for his enemies. Having turned himself away from his faith, and packed with suitcases full of weapons he follows the trail and battles zombies with 1920's style firearms (think Al Capone-like machineguns), dynamite sticks and a shotgun, as he searches town by town for answers and finds himself stumbling upon a much larger scheme of things. 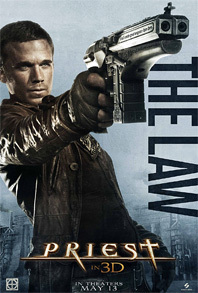 He is tracked by a group of US Marshals send to investigate, consisting of a gunslinger with a whip, a tall black guy with a huge WWI-machinegun (like the ones mounted upon the aircrafts!) and a Sioux warrior/tracker that is handy with knives and tomahawk. Add to all that an "Order of the Church" cavalry deathsquad send out to purge the defiled towns with sabers and machineguns in hand, that make no distinction between the innocent and zombies and rely only on the faith to their God and you get a glimpse of what the comic "Priest" was all about. Now take all that away what I've told you just now and replace it by merely some Vampires and a kidnapped niece story, and you get the typical "Hollywood-esque watered-down oh-look-Twilight are in at the moment(and thus Vampires instead of zombies) lets-cash-in-quick cuz' we're too lazy to write a decent script yet dare call this even an adaptation"-version, the only thing adopted is the title, "Priest". That is all that is left of what was a great read comic!